Abstract. A physical scale model of a gravel-bed braided river was used to measure vertical grain size sorting in the morphological active layer aggregated over the width of the river. This vertical sorting is important for analyzing braided river sedimentology, for numerical modeling of braided river morphodynamics, and for measuring and predicting bedload transport rate. We define the morphological active layer as the bed material between the maximum and minimum bed elevations at a point over extended time periods sufficient for braiding processes to rework the river bed. The vertical extent of the active layer was measured using 40 hourly high-resolution DEMs (digital elevation models) of the model river bed. 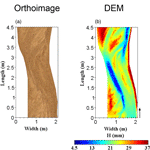 An image texture algorithm was used to map bed material grain size of each DEM. 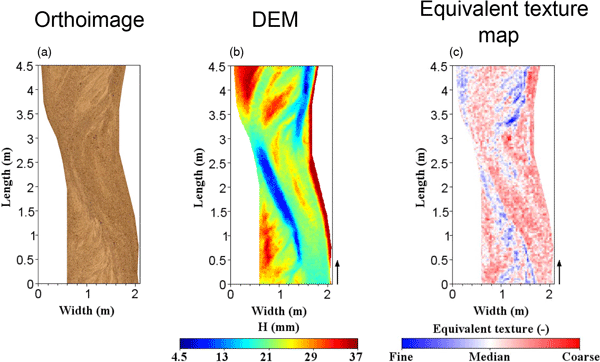 Analysis of the 40 DEMs and texture maps provides data on the geometry of the morphological active layer and variation in grain size in three dimensions. By normalizing active layer thickness and dividing into 10 sublayers, we show that all grain sizes occur with almost equal frequency in all sublayers. Occurrence of patches and strings of coarser (or finer) material relates to preservation of particular morpho-textural features within the active layer. For numerical modeling and bedload prediction, a morphological active layer that is fully mixed with respect to grain size is a reliable approximation. How to cite: Leduc, P., Ashmore, P., and Gardner, J. T.: Grain sorting in the morphological active layer of a braided river physical model, Earth Surf. Dynam., 3, 577-585, https://doi.org/10.5194/esurf-3-577-2015, 2015. A physical scale model of a gravel-bed braided river was used to measure vertical grain size sorting in the morphological active layer defined as the bed material between the maximum and minimum bed elevation. By normalizing active layer thickness and dividing into 10 sublayers we show that all grain sizes occur with almost equal frequency in all sublayers. Occurrence of patches and strings of coarser material relates to preservation of particular morphotextural features within the active layer.